Huron Consulting Group Employees to Donate Time and Talents for Annual Day of Service | Huron Consulting Group Inc.
CHICAGO--(BUSINESS WIRE)--May 7, 2014-- Huron Consulting Group (NASDAQ: HURN), a leading provider of business consulting services, today announced its third Annual Day of Service, in which employees donate their time and talents to participate in activities directed toward the betterment of the community. On and around May 9, 2014, the Company and its employees will partner with more than 50 different charitable and nonprofit organizations in more than 25 locales around the world to assist in community service projects and activities. “On a daily basis, our highly talented workforce provides support and advice to our clients to find value-creating solutions to business issues. Closer to home, our people are excited about the opportunity to roll up their sleeves to partner with charitable organizations in our communities. This is the essence of our Annual Day of Service. We encourage each other to get involved in community matters to help strengthen the social organizations around us,” said James H. Roth, chief executive officer and president of Huron Consulting Group. Having a positive impact on the community is not a one-day event for Huron. The Company, through its Huron Helping Hands program, encourages employee involvement in civic sponsorships, community service and pro bono activities year round. Huron supports its partner organizations, including Habitat for Humanity, Junior Achievement and Ronald McDonald House Charities in locations across the country, and encourages charitable giving through its matching gifts program. Atlanta – Partnering with Junior Achievement of Georgia at JA Finance Park to teach financial literacy and work readiness to local middle school students. Chicago – Helping the Boys & Girls Clubs of Chicagoorganize a Summer Olympiad competition for children from economically challenged neighborhoods. Houston – Assembling breakfasts for senior citizens in conjunction with Meals on Wheels operated by the Interfaith Ministries of Greater Houston. India – Hosting a carnival and fashion show for the children of the Arushi Girls Home, Salaam Balaak Trustin Gurgaon, in addition to reaching out to children at Deepashram, a boys’ orphanage. New York – Engaging urban youth who are interested in pursuing corporate internships through Year Up New York. 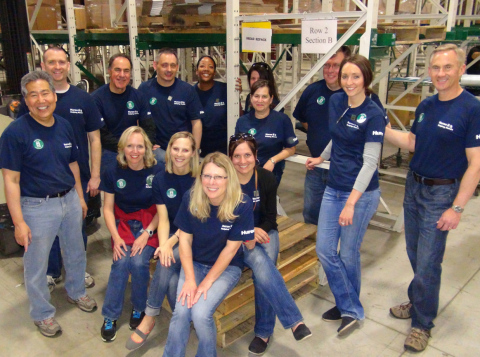 Portland – Collecting, sorting and repackaging food items and meals at the Oregon Food Bank. To learn more about the community partnering of Huron Consulting Group during its Annual Day of Service, visit www.huronconsultinggroup.com/HuronHelpingHands for a complete list of affiliated organizations. In addition, connect with us on Facebook at www.facebook.com/huronconsulting for updates on our Annual Day of Service. Stay up to date on our activities on Twitter: @Huron and @HuronLegal, or connect with us on LinkedIn and Google+ at www.linkedin.com/company/HuronConsulting and https://www.google.com/+huronconsulting. Huron Consulting Group was founded in May 2002 with 200 people and has grown to more than 2,500 today. Its business segments include: Huron Healthcare; Huron Legal; Huron Education and Life Sciences; and Huron Business Advisory. The Company was recognized by Consulting magazine as one of the Best Firms to Work For in 2013 and as a Top Workplace in 2013 by The Chicago Tribuneand The Oregonian.